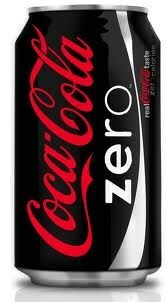 Coca-Cola Zero or Coke Zero is a product of The Coca-Cola Company. It is a low-calorie (0.50 kilocalories per 150ml) variation of Coca-Cola specifically marketed to men, who were shown to associate diet drinks with women. It is marketed as tasting indistinguishable from standard Coca-Cola, as opposed to Diet Coke which has a different formulation. The Coca-Cola Zero logo has generally featured the script Coca-Cola logo in red with white trim on a black background, with the word "zero" underneath in lower case in the geometric typeface Avenir (or a customized version of it). Some details have varied from country to country. In the U.S., the letters decline in weight over the course of the word.